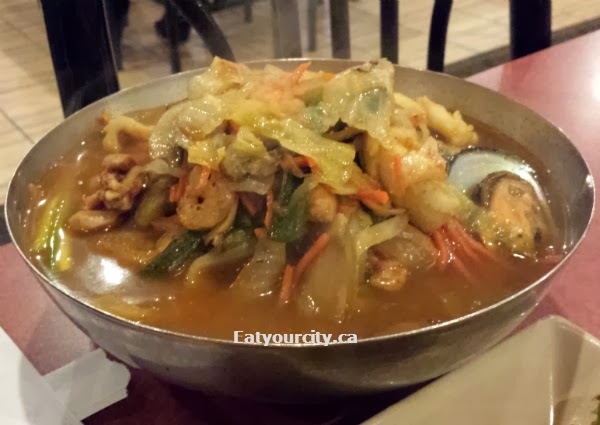 Eat Your City: Ginseng Restaurant Edmonton, AB - Delicious Korean chap chai, BBQ ribs, soups and more - its not just an all you can eat buffet here! Ginseng Restaurant Edmonton, AB - Delicious Korean chap chai, BBQ ribs, soups and more - its not just an all you can eat buffet here! Posted by While we usually go to Ginseng when we have a huge craving for their all you can eat Korean BBQ buffet for their awesome Korean beef ribs (you can read about the buffet experience here), for my little brother's birthday a few months ago, we headed there to eat off the menu, rather than the all you can eat.. just to mix it up a little. It was just a small group of four, so everyone picked an item or two off the menu and off to nomnomnom we go! Apologies for the poor pictures - my brother took pictures that night with his phone and I'm not sure if it was the lighting, or the haze of BBQ smoke from other tables, but the pics didn't turn out super great. 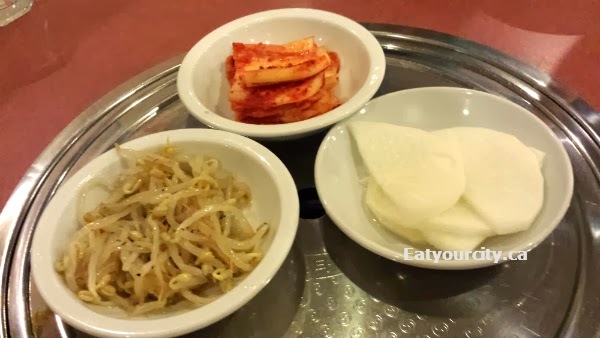 As with most traditional Korean restaurants, a selection of complimentary Ban Chan is served. Kimchee and a savory sesame flavored bean sprout salad and pickled diakon (my dad's favourite) comes out quickly after we order. I think my dad had four bowls of the pickled crisp diakon to himself lol! One of my brother's favourite dish to order at any and every Korean restaurant we go to is Bi Bim Bap, and that night was no exception. The hot stone bowl is super heated up, and then rice, sauteed/grilled meat, vegetables and a perfectly cooked sunny side up egg is layered in and its served with a sweetened chili sauce. You add in as much of the chili sauce as you like (we asked for 2 little bowls of the stuff), mix it up and dig in! Later, you chip at the crispy rice at the bottom after eating all the rice at the top that has absorbed all the savory juices from everything else. Mmmmm! The next dish was Bolgogi - Tender beef slices marinated in a sauce sweetened with Asian pear and paired with onions on a sizzling platter. Awesome served on rice, and the portion size was mammoth! My family enjoyed eating this the next day for lunch. Next up was my favorite dish - Chap Chae or potato noodles sautéed with beef, sprouts, vegetables and redolent in sesame oil. Its sesame oil infused carb heaven! We also ordered the Korean BBQ beef ribs. Cooked to a medium rare with some pieces well done, scissors and tongs are provided to cut the slabs of yumminess to bite sized pieces, or you can pick up the slabs to eat with your hands if you want. Its super tender from the Asian pear and kiwi marinade. We actually had to pack some home as again, the portion size was huge! Last but not least, we had Jiam Bong a spicy seafood noodle soup (Thanks LL for the name!) I misplaced the picture of the menu I usually take... and its fantastic! Loaded up with shrimp, mussels, squid, a mountain of vegetables and some potato noodles in a spicy savory hit the spot soup, its a winner and a must have! We finished off the huge dinner with a cake I brought in, and had to waddle out with bags of packed leftovers for lunch. 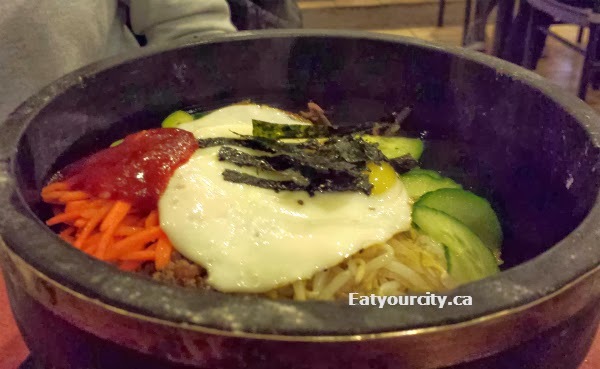 With excellent service and delicious traditional Korean eats, we'll be back again soon! Mmmm!